Yesterday we successfully tested one of the main separation systems of the Ares I-X rocket at the Alliant Techsystems (ATK) facility in Promontory, Utah. The test demonstrated that the forward skirt extension, which houses the main parachutes will be able to separate from the first stage booster as it falls back to Earth after launch. During the flight test, the first stage booster will separate for the frustum, which is a cone-shaped piece of the rocket that connects the 12-foot-diameter first stage booster to the 18-foot-diameter upper stage. After the frustum separation, at an altitude of about 15,000 feet, the nose cone of the booster will be jettisoned and the pilot parachute will be deployed. The pilot chute will in turn deploy the drogue parachute, which will re-orient the booster to vertical and will slow it down enough that the main parachutes will be about to open. At about 4,000 feet the forward skirt extension separates from the rest of the first stage and pulls out the three main chutes packed inside. The booster splashes down and is recovered and reused. During the test at ATK, a linear-shaped charge was used to separate the forward skirt extension and create a clean severance. 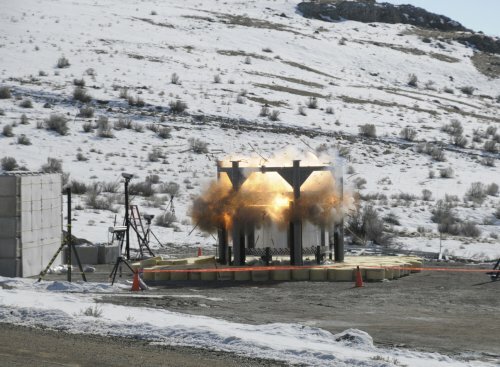 Engineers also measured the shock created by the charge and will use that data to analyze the system and prepare for the Ares I-X flight test as well as the development of the Ares I rocket. About the Author: Keith Henry serves as a Public Affairs Officer at NASA’s Langley Research Center. Reporters gathered yesterday to see recently completed Ares I-X flight hardware on display at NASA Langley Research Center. The hardware, which was designed and built at Langley, is engineered to represent the outer surface of Orion crew module and a launch abort system that will increase crew safety on the Ares I rocket. Next week, the rocket hardware pieces will be shipped from Langley to NASA’s Kennedy Space Center in Florida. The simulated crew module and launch abort system will complete the nose of the rocket. As many as 150 sensors on the hardware will measure aerodynamic pressure and temperature at the nose of the rocket and contribute to measurements of vehicle acceleration and angle of attack. The data will help NASA understand whether the design is safe and stable in flight, a question that must be answered before astronauts begin traveling into orbit and beyond. See construction videos and images on the Ares I-X Web site. Media Day Photo: While workers put the finishing touches on the Launch Abort System, left, and Crew Module simulators, reporters interviewed project officials and photographers and videographers captured the moment. 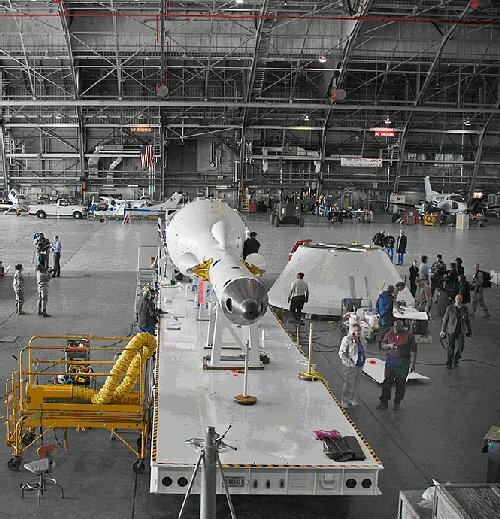 The rocket elements are being placed on special flatbed trailers which will be rolled onto an Air Force C-5 for a two-hour flight to NASA Kennedy Space Center Jan. 28. About the Author: Amber Philman serves as a Public Affairs Officer at Kennedy Space Center. Looking out over Kennedy Space Center’s skyline toward the Atlantic Ocean, the stage is being set around Launch Pad 39B for the next generation of NASA space vehicles. 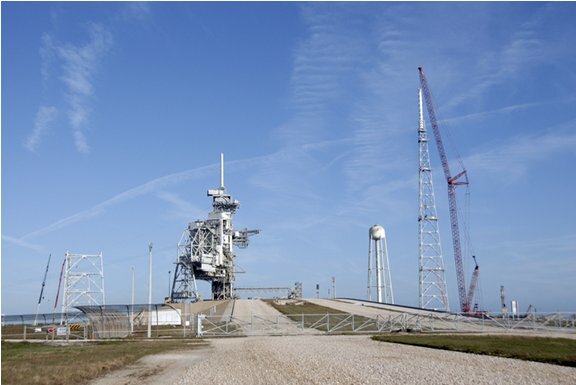 On January 4th a huge crane lifted the remaining steel structure and fiberglass mast from the ground and hoisted it up, completing a 600-foot-tall lightning tower that now sits on the east side of the launch pad. The tower is the first of three that are part of the new lightning protection system for the Constellation Program’s Ares and Orion launches. The contract to complete the work was awarded to Ivey’s Construction Inc. on Merritt Island in July 2007 and construction on the foundation for each began in August 2008. It’s taking 900 tons of steel, about 50 NASA and contractor workers, as well as two cranes, a small one and a mammoth one, to complete the work. The small crane rotates tower segments, while a 640-foot-tall Manitowoc Model 2100 crane lifts segments to higher elevations. Workers preassemble sections of the tower on the ground before lifting them into place. The initial assembly of all three towers is expected to be complete by April and the whole lightning protection system by March 2010. The pad’s fixed service structure and rotating service structure will be demolished in 2010. A system of overhead wires attached to the mast of each tower will provide the Ares launch vehicles a blanket of protection from lightning strikes, while cameras installed on each tower will record any strikes. For the Ares I-X test flight, currently targeted for July 2009, the overhead wires will be attached from tower 2 to tower 1 to protect the vehicle. The towers also will house weather stations at four elevations to measure wind speed, wind direction, temperature and humidity. When all the work is complete, this launch pad will look quite a bit different. Welcome to the New Ares I-X Blog! 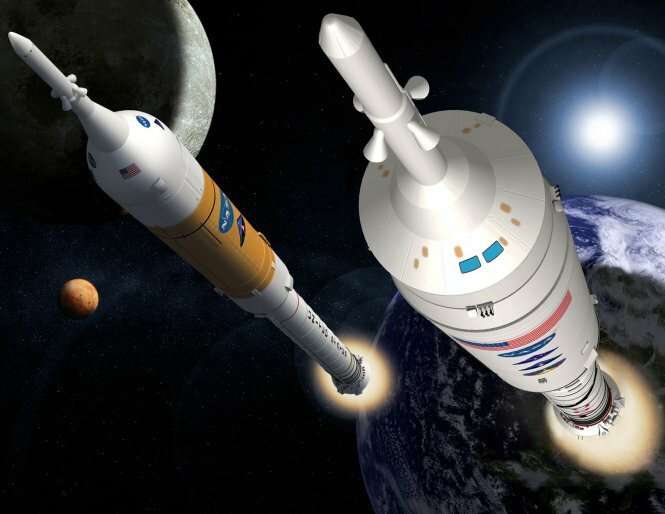 A few of us who work here at NASA on the Ares I-X team thought this blog would be a nice way to keep America and the world informed about the Ares I-X rocket and the first steps into NASA’s next generation of space travel. We’ll post news and information about progress and program milestones, but we’ll also try to give a behind-the-scenes peek at how a new rocket gets put together. So what is the Ares I-X rocket? It is the first flight test vehicle for the next generation of NASA spacecraft –the Ares I rocket. In fact, the Ares I-X rocket has been built to resemble the size, shape and weight of the Ares I rocket so that NASA engineers will get valuable information that will help them design and fly the new rocket. Additionally, NASA gets a chance to test and prove launch operations on the ground that they’ll need for the new kind of rockets. We put together this video to explain a little more about the Ares I-X and its mission. You can view it here in streaming Windows format. The Ares I-X is first in a series of at least 6 vehicle flight tests scheduled by NASA to help get ready for the new Ares I. Launch of the Ares I-X is scheduled for later this year from Kennedy Space Center in Florida. Author dnkaniganPosted on January 15, 2009 March 19, 2013 Tags Ares, ares I-X, constellation, to the moon23 Comments on Welcome to the New Ares I-X Blog!